NSUJL attends 2019 IBEW Construction and Maintenance Conference | NSUJLThank you! NSUJL Vendor Booth, 2019 IBEW Construction and Maintenance Conference, Washington, D.C.: Here’s Rae & Lorenza, ready for the day! We debuted our new tablecloths, as well as a few new giveaways. These included measuring tape key chains and eyeglass cleaners with the NSUJL logo. NSUJL attends 2019 IBEW Construction and Maintenance Conference in Washington, D.C.
NSUJL had a fantastic time in DC! We kicked off our 2019 event season by exhibiting at the 2019 IBEW Construction and Maintenance Conference in Washington, D.C. this past week. We enjoyed catching up with everyone, as well as meeting a few new faces & we’re looking forward to seeing you again soon – check our upcoming events at the top of this newsletter to see where we’ll be next! Lorenza spoke on behalf of NSUJL during Thursday’s conference sessions. She talked about how her views have changed since coming to work for the non-profit in January and how the first accident she’s dealt with has affected her. She also highlighted a few new programs we’re offering – A Dollar for Your Brother and A Lineman’s Child. A Lineman’s Child allows you to sponsor a disabled or fallen lineworker’s child. A permanent injury or loss within a family will change a child’s life forever. We hope to help these children regain a sense of normalcy after an accident. For $10/month, you can help one child over 13, or two children under 13, receive birthday gifts. For $50/month, you can help one child receive birthday gifts, as well as attend a camp that suits their individual needs or desires. Click here to sign up for this program. Thank you for your amazing donations! We are so thankful for everyone’s support in D.C. this year. 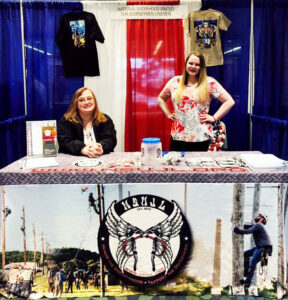 We love how much the Sisterhood is always supported among the IBEW! Of course, we were honored to receive over $3,500 in donations from booth visitors and passing the bucket during our presentation. And then, we were humbled to receive a $25,000 check from NECA/IBEW. We cannot show our gratitude enough for everyone’s continued support. Thank you, thank you, THANK YOU!